The end of the year usually fills itself with decorations and silver bells. As much as we love to celebrate the season, there are others that wish to steal it. Having a good plan for holiday home security is a must. Learn the quick and simple way to protect your presents and your home. Do not announce publically that you plan to travel back to your hometown for Christmas. In fact, even if you’re leaving the house for the afternoon, try not to make it obvious that you are not home. Consider connecting your interior lights to a timing schedule. That way, people will think you are there. It may seem like an easy gesture, but it makes a big difference in holiday home security. Smart devices are everywhere and many contain hidden cameras. Users can see a live view of their front door and know what’s happening. Features like these are extremely important during Thanksgiving and Christmas time. Most thieves will do a test knock to see if anyone is home. If no one shows, they will either enter or walk around to the back of a home. 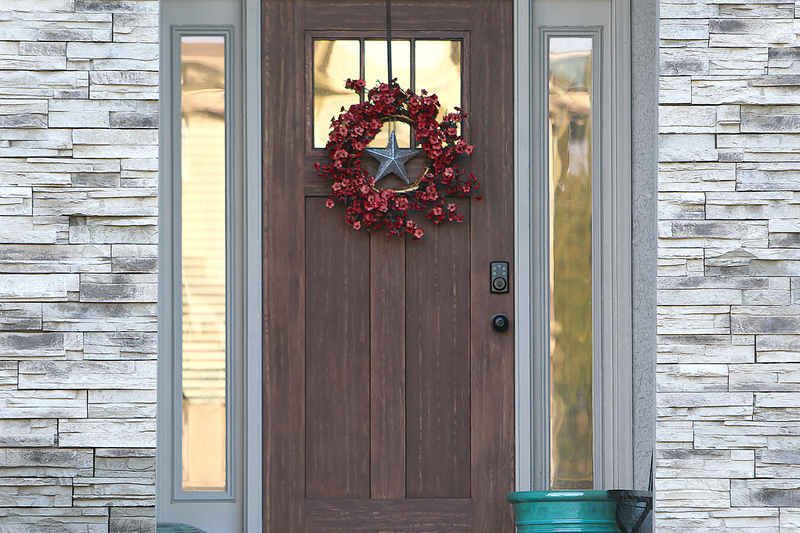 Smart doorbells with intercom capabilities have deterred many holiday break-ins. Many people post pictures of their holiday trees on social media. This unknowingly shows everyone the abundance of potential goodies one can take from your home. While settings exist to keep your photos private, don’t take things nonchalantly. Even friends of friends have the potential to see the photo, especially if someone comments on it. Use caution and do not post details about your presents. As part of your holiday home security, don’t forget about your mailbox. The United States Postal Service offers informed delivery and it’s really helpful for mail recipients. You can view a grayscale image of mailpieces scheduled to arrive soon. That means, when you receive a letter-sized holiday card, you’ll know about it. Informed delivery also notifies you about incoming USPS packages, too. It may seem ideal to have a beautifully decorated Christmas display at your window. However, anyone that drives by will now see all of your valuables. Try positioning your tree towards the interior of your home, instead, to make things less attractive to would-be thieves. While it’s not always easy to talk about potential threats, it’s best to remain diligent. Protect your home investment this holiday season by using the simple tips above.